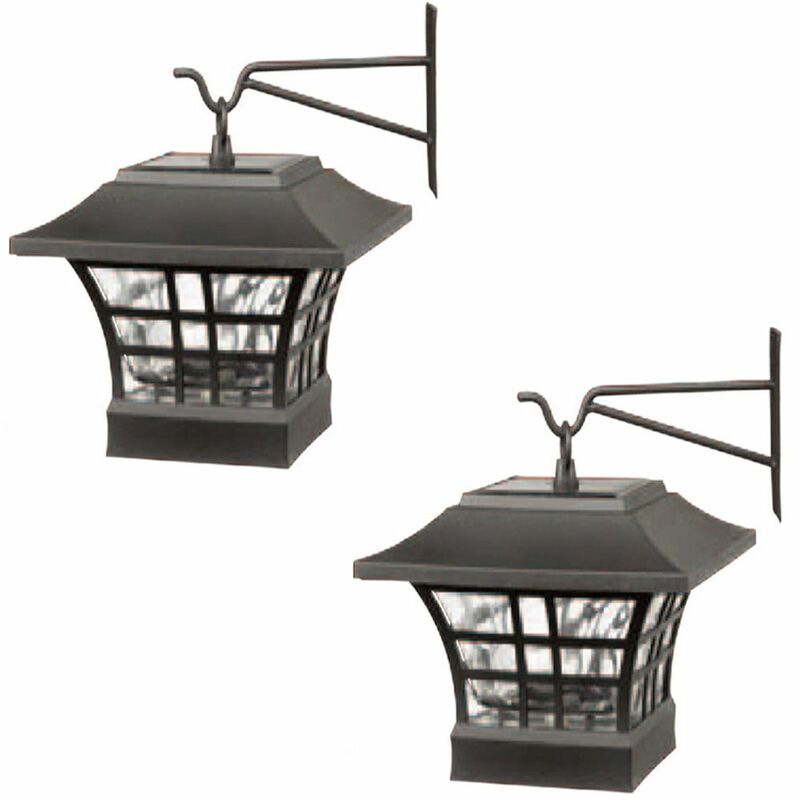 Solar powered multi functional or multi use deck post, fence, and table top lantern look lighting fixture. Black finish with water glass lens for elegant light distribution. Sold as a twin pack, Hook for mounting to a fence or wall (included). The Flora 3 in. fitter mount Solar Lamp is a great addition to your landscape setting. Easily fits on any existing 3 in. lamp post. It features dusk to dawn operation and a decorative ivy wrap to accentuate the light. The lithium ion battery adds extended battery life to the light which allows for less changing. Its antique bronze finish is a beautiful way to enhance your landscape. The Gama Sonic Baytown Solar Black Outdoor Freestanding Lamp Post is the perfect energy-saving and money-saving replacement for outdated electric or gas-powered outdoor lighting, plus it lets you show off beautiful flowers and foliage day and night. Standing 77-inch tall from finial to the bottom of its poly-resin planter base, the rust-resistant cast-aluminum lamp post with a powder-coated black finish requires no electrical wiring to set up. Just secure the post to a concrete pad with the included bolts, and the sun will do the rest. Designed for dusk-to-dawn performance, the lamp's internal lithium-ion battery pack charges when sunlight hits the four integrated solar panels, so at dusk, the six bright white LEDs turn on automatically and shine through the real glass panes at 80 lumens on a full solar charge. Built for years of hassle-free operation, the lamp's monocrystalline silicon solar panels are protected by durable tempered glass that helps ensure long-lasting reliability. The Gama Sonic GS-94C-D Victorian rust-resistant cast-aluminum solar lamp post stands 90 inches and has two downward hanging lamp heads. The unit requires no electrical wiring to set up. Just bolt the Victorian GS-94D to a concrete pad, and let the sun do the rest. The replaceable Li-ion battery pack charges when sunlight hits the five-watt monocrystalline silicon solar panel. At dusk, 13 bright-white LEDs per lamp will turn on automatically and shine at 200 lumens through bevelled glass. The unit is designed for dusk-to-dawn performance when the battery pack is fully charged by a day's worth of direct sun. If sunlight is limited, switch the LED brightness too low to extend nightly light duration. Extra benefits include Gama Sonic's patented light-enhancing cone reflector, panel protection with durable tempered glass, and a battery pack that should last for about 1,000 charges. For any product questions or unexpected issues, Gama Sonic support at our Atlanta headquarters is here to help. The cornerstone of the Providence Collection is quality, and this outdoor traditional post head light is no exception. Combining a classic brushed nickel finish and posh styling, you will find no better way to highlight the charm of your home. With the superb craftsmanship and affordable price this fixture is sure to tastefully indulge your extravagant side. Solar LED Deck Post with Hanging Option (2-Pack) Solar powered multi functional or multi use deck post, fence, and table top lantern look lighting fixture. Black finish with water glass lens for elegant light distribution. Sold as a twin pack, Hook for mounting to a fence or wall (included). Solar LED Deck Post with Hanging Option (2-Pack) is rated 4.0 out of 5 by 4. Rated 5 out of 5 by Larry from Good product Bought this light for the deck post. Its a really nice decoration. Rated 5 out of 5 by Norman from Work well, stay lit for hours! They work fine so far.. purchased about 6 weeks ago. Rated 5 out of 5 by Mary in Ladysmith from Great solar lanterns for post tops We purchased these two years ago and have been delighted with them. Sadly the crazy wind on Vancouver Island recently downed the fence they were on and broke the glasses, but we will be buying identical replacements. Rated 1 out of 5 by smreid from Hampton Bay 2 Pack Solar Lights Have had for 2 years. Both lights will not work any longer. Have been properly maintained. The hanging loop on one has broken. I think that water has gotten into the light to cause it not to work. Poor design on the top of the lanterns. What size fence posts do they fit? Why won't the lights turn on? Is there a switch?